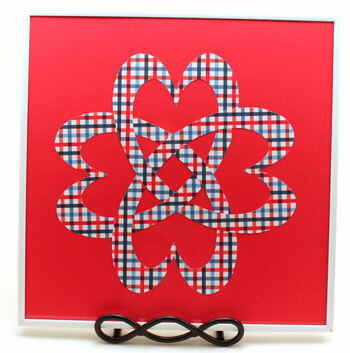 This is an Easy Paper Crafts Celtic Designs Celtic Heart Knot using simple and inexpensive materials and tools. Actually, this is a modified design for the Celtic eternity or love knot. I’m using the heart shape as the basis for the never-ending loops of the Celtic eternity knot. Simple, yet interesting, this Celtic Heart Knot design makes a striking addition to any decor. Plus, it adds a conversation piece. You can explain the neverending eternity knot or the 8-18 unique knot of mathematical knot theory. Either way, this beautiful Celtic Heart Knot is easy and inexpensive to make. Head over to the Easy Paper Crafts Celtic Designs Celtic Heart Knot to view the easy instructions and find the printable pattern. Recently, I needed to repair a loose button and the pockets in a couple of jeans. Since I had to do the repairs anyway, why not share the steps with others who can then make their clothing last longer. So, today’s post introduces How to Sew on a Button and How to Repair a Jeans Pocket. The tasks are not too ornery, but they do take a little time. The result, however, is increased life of the shirt and usable, perfectly good jeans. Take a little time to go through the steps and the result will be better than new. Why better? Because you will attach the button more securely than a machine can. The second repair took a little longer, but it, too, was easy. This view is from the inside of the pocket – where the personal treasures and the hand would go. The seams are finished such that neither the fingers nor the things in the pocket will catch on an unfinished seam. Frequently, if someone uses their jeans pockets a lot, the pockets wear out much quicker than the jeans themselves. 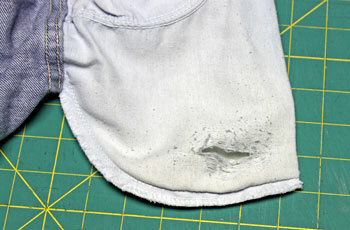 These steps for how to repair a jeans pocket will keep your jeans useful and longer lasting. 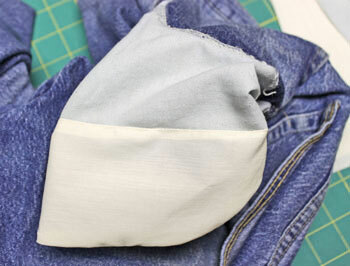 Visit the funEZcrafts how-to section to learn how to sew on a button and how to repair a jeans pocket. Have fun making your shirts, blouses and jeans last longer! This easy paper crafts project takes a little time to learn, but once you know the steps, it’s very simple to do. 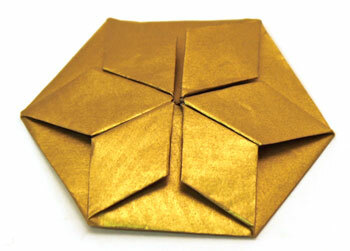 Here’s a close-up view of the gold six-point star made with the steps on the Easy Paper Crafts Six Point Star page. One caution, you need to be careful with your measurements. The project doesn’t require perfection, but if the lines or angles are off by much, the resulting star will show the problems. Don’t let that scare you. 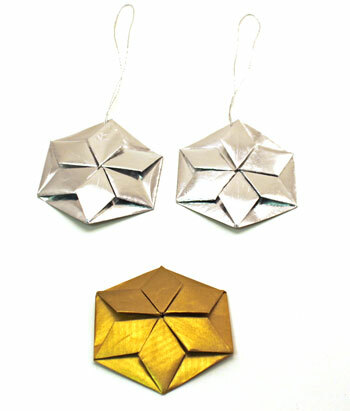 The easy paper crafts six point star is simple once you do one or two or three. Plus, they make pretty decorations any time of the year – hanging in a window, added to a gift, given to a child for a job well done, or any other application you can think about. I know, I know, it’s more than two weeks beyond the new year, but happy new year, anyway! The project’s idea stems from a friend who always buys a pocket calendar each year. She likes to put important reminders and information she needs in the calendar’s pocket. When she no longer needs the information it either gets filed or thrown away. 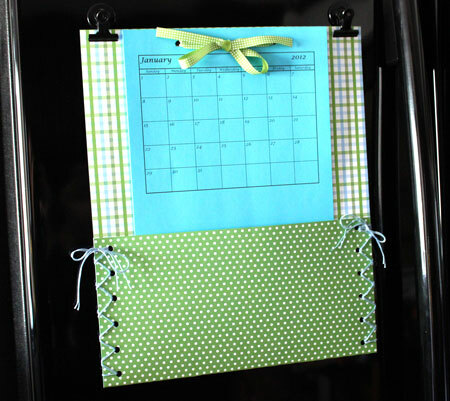 I’ve been thinking of how I could make a similar yet easy and inexpensive pocket calendar. While working on some non-crafty tasks, I started designing the project in my head. My initial thoughts about how to make the pocket calendar were more complex, but I like this simpler version of an easy paper crafts pocket calendar much better. It’s simple. It’s inexpensive. Most important, it’s fun and easy. The materials and tools are inexpensive and the steps easy. And, if you prefer more embellishments, there is plenty of room. Visit the easy paper crafts pocket calendar page to see how much fun and easy the project is. Merry Christmas and Happy Holidays to you and yours! May the new year bring you health, happiness and prosperity! 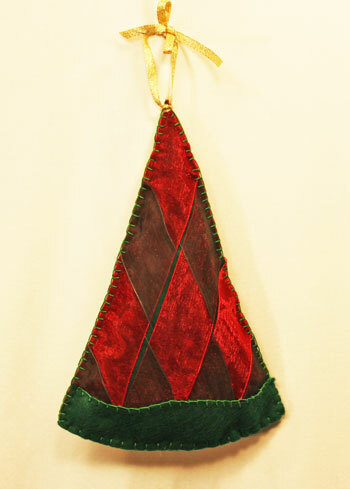 Just a quick post today to highlight our Woven Ribbon Christmas Tree Door Hanger. They’re simple, inexpensive, fun and pretty. What fun they are to make and to display! 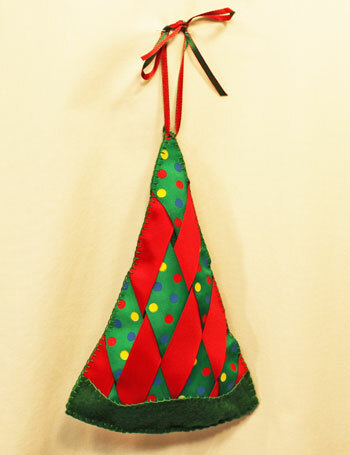 You can find the instructions on our Easy Christmas Crafts Woven Ribbon Christmas Tree Door Hanger page. We also link to detailed instructions for how to sew a blanket stitch and how to sew a blanket stitch overlay. 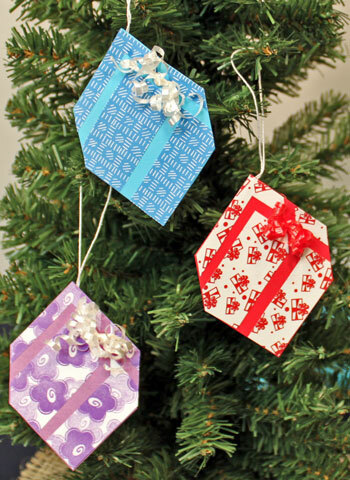 This Easy Paper Crafts Gift Box Gift Tag can address a gift or hang prettily on a Christmas Tree. Either way, they’re fun, easy and whimsical. The list of materials and tools along with the illustrated steps for how to make these pretty little gift boxes can be found on our main site: Easy Paper Crafts Gift Box Gift Tag. Whether you make a few or many, they’re easy and inexpensive. Paper doilies provide versatile and easy Christmas decorations. 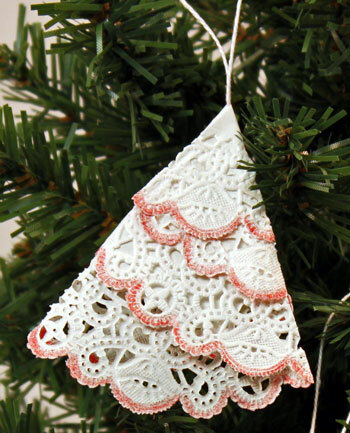 Take a look at the new Easy Christmas Crafts Paper Doily Folded Christmas Tree Ornament we just added to the web site. Whether you make the smaller version with its colored edge or the larger version with its contrasting paper accents, they are both easy, fun and fast to do. 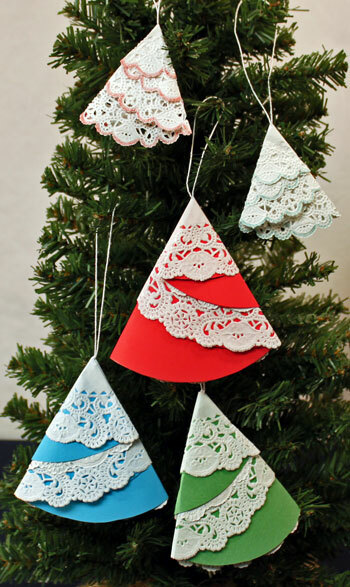 A four-inch paper doily makes a small, sweet little folded Christmas tree to add as a decoration on your Christmas tree. 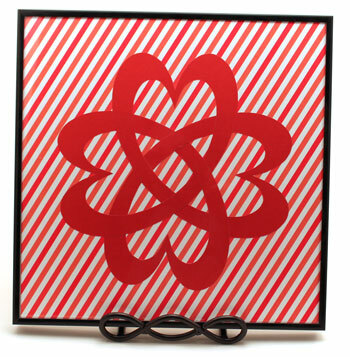 A six-inch paper doily makes a slightly larger decoration and adds an accent with its contrasting paper backing. 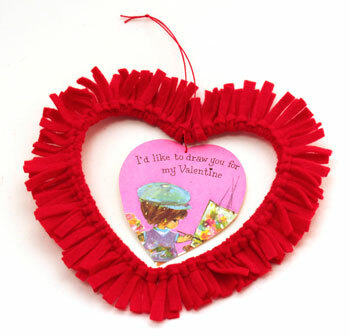 But, these pretty little decorations can be used in other ways too. They are so fast and so easy, you could make a garland of these folded Christmas trees to hang above a fireplace, along a chair rail, in an open doorway or anywhere a pretty little garland would add a Christmas highlight. 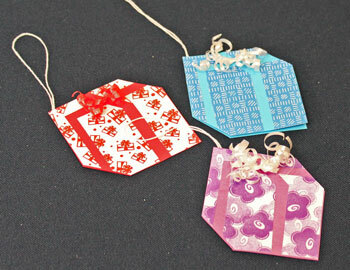 These simple decorations could also be used on gifts as a gift tag or as an additional little gift on the outside of a package. Though simple, you can vary the colors to make different versions. Both the young and young-at-heart can enjoy making these fast and easy ornaments. 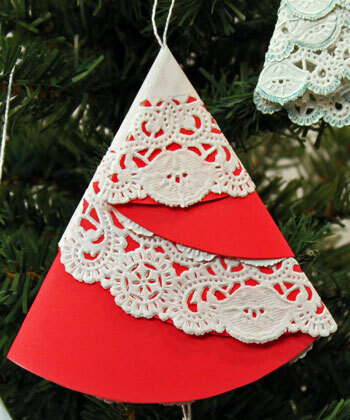 Take a look at our Easy Christmas Crafts Paper Doily Folded Christmas Tree Ornament page to see the materials and tools along with the steps to make the two different versions of the ornament. 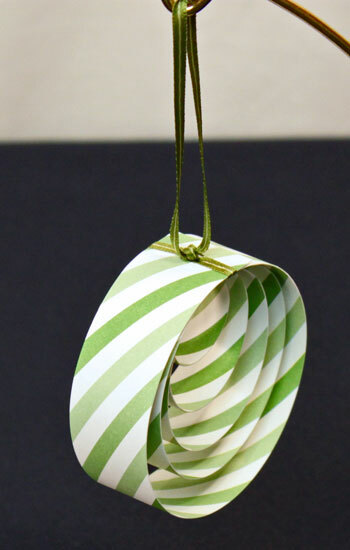 This Easy Christmas Crafts Paper Circles Ornament can be made quickly, easily and inexpensively. This example was made with decorative card stock, but the Easy Christmas Crafts Paper Circles Ornament would be just as pretty made with contruction paper or color tinted paper. This pretty little ornament would also be a great project for children to color. 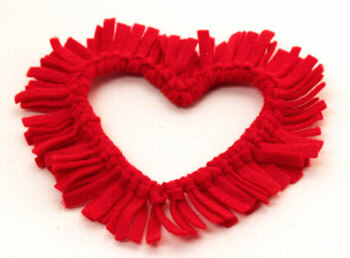 Our examples are simple and pretty, but the project lends itself to other embellishments such as beads and charms. You can find the list of materials, tools and the detailed instructions on our main site: Easy Christmas Crafts Paper Circles Ornament. We provide step-by-step pictures to show how the ornament is made, too.